As you may have noticed most of the pieces on the chess board are, at some time, under the protection of other pieces from the same team. This procedure is based on suppressing a piece which is protecting another piece or another square on which a potential attack could occur. The next examples should make everything more clear. 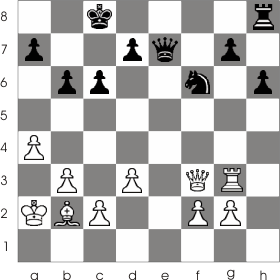 The following game appears to be balanced: both sides have an equal number of pawns and two pieces with the same value. But things aren't always what they seem to be, h:g5!. With this move White has now an extra pawn. 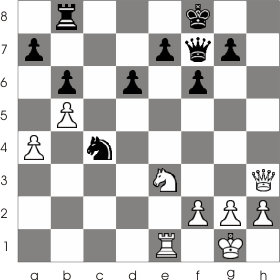 Black is unable to capture the white pawn f:g5 because he would remove the knight's defense and then B:e5. 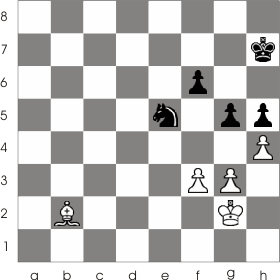 In the next example White attempts to remove the defender of the black rook from f5 with 1. Rf1:f5. But Black has a good response; he will make the intermediate move 1...Rd4:d1 2.Kc1:d1 Bc8:f5. So, in the end, Black has the advantage by having the extra bishop. White made a mistake when he removed the defender of the knight. This is another argument in favor of the idea that in chess you always have to pay attention to what you're doing. 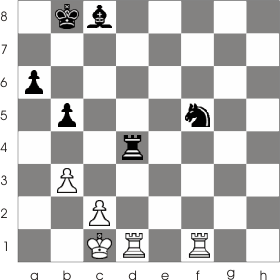 In the next example White moves 1. R:g7; this removed one of the black knight's defender. Now the next move is possible 1...B:f6 Qh7 2. B:h8 Q:h8. After his combination White won a pawn (remember that many times an extra pawn is enough to help you win the game). Look at the example below. Black moves 1...B:f3!. This is a good move because White has to capture the bishop in order to win back the lost value (the knight); but when he'll capture the bishop he'll leave the pawn from h3 defenseless. 2. g:f3 3. R:h3+ Kg2. White has now a bad situation: he's down a pawn and those two he has are on the same column! In the next game it's White's turn to move. If you payed attention until now you won't have many troubles in spotting the best move: 1. 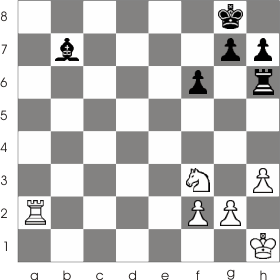 Qh8+ Qg8 (the only possible move) 2.Q:g8 K:g8, and now that the knight from c4 no longer has the queen to protect him, he will be captured and thus White will end up with an extra knight N:e4.